Supergrass were an alternative rock band which formed in Oxford, England in 1994. The band consisted of brothers Gaz (guitar and lead vocals) and Rob Coombes (keyboards), Mick Quinn (bass and backing vocals) and Danny Goffey (drums and backing vocals). In summer 1994 they released their first single Caught By The Fuzz which had Strange Ones on the B side, on a small local record label called Backbeat, run by Makating bass guitarist Dave Norland from his bedroom in a house in the Cowley Road area of Oxford. In summer 1994 they released their first single Caught By The Fuzz which had Strange Ones on the B side, on a small local record label called Backbeat, run by Makating bass guitarist Dave Norland from his bedroom in a house in the Cowley Road area of Oxford. The song was successful and it didn't take much time when the Parlophone label signed them and few months later re-released Caught By The Fuzz again. In the spring of 1995 was released another single Mansize Rooster followed by Lenny right before they released debut album I Should Coco in May 1995. It was their only album that made an impact in the USA. In 1997, they released their second album, In It For The Money which got them even more acclaim, but slightly darker sound confused many of their fans. Still, it was a success, both critically and financially. 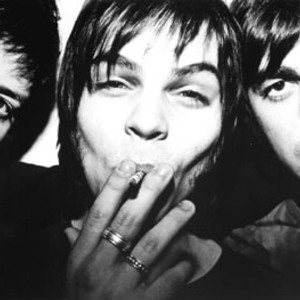 The third album, released in 1999, Supergrass (or the X-Ray Album, as the fans like to call it because of the cover) was more of a continuation of In It For The Money, and was not received as well as the former albums. After the three-year-pause, Supergrass returned with Life On Other Planets (2002), which was again not succesful financially, but the critics loved it. It was also the first Supergrass album where Rob Coombes was named as the official member of the band. After the best-selling 2004 greatest hits compilation Supergrass is 10, they released Road To Rouen, their fifth album in 2005, after some delays. It was well received but it's new direction was a surprise to many fans. The band recorded their sixth studio album Diamond Hoo Ha between January and November 2007 in Berlin and New York. It was released in March 2008 and although criticised as formulaic, displayed strong song writing. In 2010 they announced they would disband and played a handful of farewell shows in June. The unfinished 7th studio album Release the Drones remains unreleased.